IAC joins the entire immunization community in mourning the loss of Betty Bumpers, a giant in the world of immunization and co-founder of Every Child By Two. While serving as First Lady of Arkansas, Mrs. Bumpers became a tireless advocate for childhood immunizations. Together with former First Lady Rosalynn Carter, she led a state-by-state campaign promoting preschool immunizations. 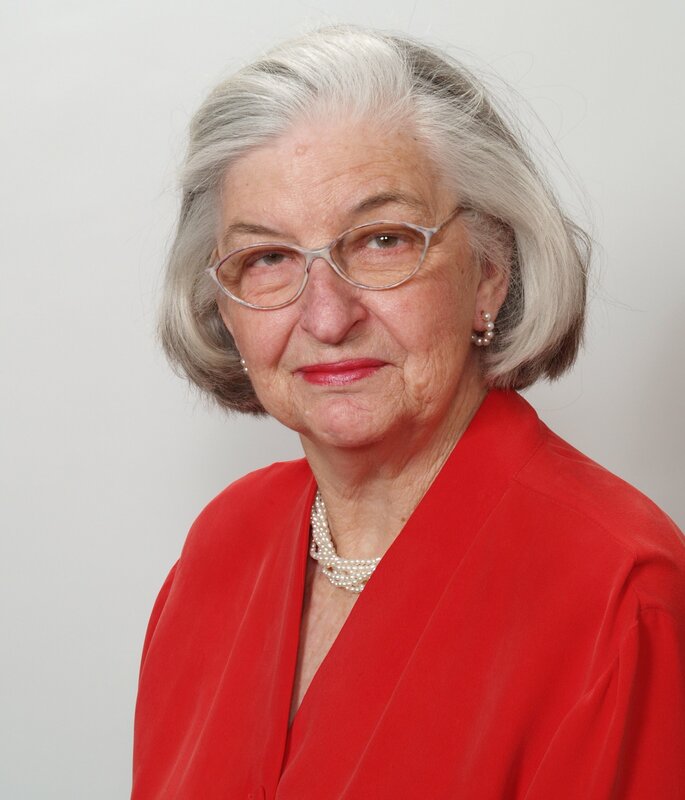 Betty was a strong and life-long advocate for children and immunizations. All of us who had the honor of working with Betty feel a profound loss today. As First Lady of Arkansas in 1974, Betty forged a partnership with Rosalynn Carter, who at the time was First Lady of Georgia, to improve immunization services for the children in their home states. They worked together through the Carter administration in support of immunization programs and were credited with the passage of state laws mandating vaccines for school-entry. Their efforts were formalized when they founded “Every Child By Two” following a devastating measles outbreak in 1991 that took the lives of many children. Betty’s work to advance immunizations has saved countless lives that would have been lost to deadly, preventable diseases. So many people were touched by her generosity, humor and deep determination to use the power she had to make the world a better place. We mourn the loss of our friend, co-founder and mentor. We are heartbroken by this loss but are grateful to have had the honor to work along aside her in pursuit of a better, safer and healthier world. The full obituary of Betty Lou Flanagan Bumpers is available on VYF’s website. Our immunization community is deeply grateful to have been supported by Betty’s energy, passion, and determination. Betty, we will miss your vision and your presence. We are more appreciative than we can express for all you have done to save so many lives. In lieu of flowers, Betty’s family asks that memorials be made to Vaccinate Your Family: The Next Generation of Every Child By Two through its website at www.vaccinateyourfamily.org/how-your-donation-helps/. Checks should be made out to “Every Child By Two” and mailed to 1012 14th Street, N.W., Suite 415, Washington, DC 20005. Influenza season is now under way. 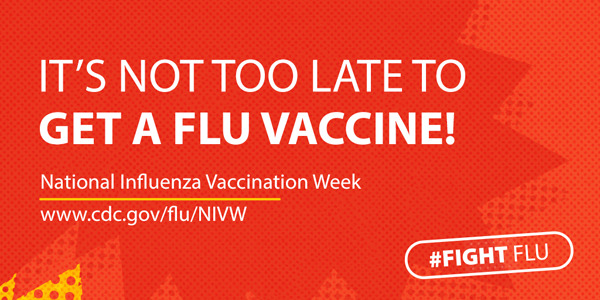 National Influenza Vaccination Week (NIVW) is an awareness week focused on highlighting the importance of influenza vaccination. NIVW will be observed this year on December 2–8. This is a great time to vaccinate your patients who have not yet been protected against flu and to remind your patients who have not been vaccinated to be sure they get protected. CDC has stated in its Weekly U.S. Influenza Surveillance Report, FluView, that as of the week ending November 17, the geographic spread of influenza in one state was reported as regional; Guam and 14 states reported local activity; and the District of Columbia, Puerto Rico, the U.S. Virgin Islands and 35 states reported sporadic activity. A total of three influenza-associated pediatric deaths have been reported for the 2018-2019 season. Influenza vaccination is recommended for everyone six months of age and older. As a reminder, vaccination efforts should continue through the holiday season and beyond. Peak influenza activity does not generally occur until February. Providers are encouraged to continue vaccinating patients throughout the influenza season, including into the spring months (e.g., through May), as long as they have unvaccinated patients in their office. Click on the graphic below to access many related resources from CDC, including web tools, a NIVW toolkit, videos, communication hints, matte articles to submit to newspapers, animated graphics, and more. On September 26, Sharon G. Humiston, MD, MPH, FAAP, IAC's associate director for research, presented a one-hour webinar titled Adolescent Immunization Update and the 16-Year-Old Platform: Making a Difference You Can Count On. During her presentation, Dr. Humiston reviewed the recommendations for adolescent vaccines, including those recommended at 11–12 years of age and those at age 16. The 6-slide-per-page handout of the content is also available for your review. This presentation can be found on the home page of IAC’s main website at www.immunize.org. To view it, scroll down to the middle of the page to Dr. Humiston's photo and click on the link. In addition, the slide presentation is available on IAC’s PowerPoint Slide Set web page in a 6-slide-per-page handout format. To request her PowerPoint format slide set, go to this web page and below the presentation's title and description, click on "Request the PowerPoint slide set" and IAC will email the request form for the PowerPoint presentation. Once you have submitted your request, we will send you the presentation. You can edit and use it as you see fit. In what health officials call the largest outbreak in the state since the chickenpox vaccine became available more than two decades ago, Buncombe County of North Carolina has released information about an ongoing chickenpox outbreak at a private school. The first and fifth paragraphs are reprinted below. The varicella (chickenpox) outbreak at Asheville Waldorf School has grown to 36 students. Health officials continue to monitor the situation and strongly encourage everyone in the community to do their part to reduce the spread of this outbreak. Dr. Jennifer Mullendore, the Buncombe County Medical Director, wants the community to be a part of the shield of protection that immunizations provide. “We want to be clear: vaccination is the best protection from chickenpox. Two doses of varicella vaccine can offer significant protection against childhood chickenpox and shingles as an adult. When we see high numbers of unimmunized children and adults, we know that an illness like chickenpox can spread easily throughout the community—into our playgrounds, grocery stores, and sports teams." Additional resources, including information booklets for patients, are available in the full November newsletter. Access the sign-up form to subscribe to Vaccine Update for Healthcare Professionals. On November 19, Dr. Robert R. Redfield, director of CDC, announced the establishment of an Acute Flaccid Myelitis (AFM) Task Force to aid in the ongoing investigation to define the cause of, and improve treatment and outcomes for, patients with AFM. A portion of the press release is reprinted below. The AFM Task Force will bring together experts from a variety of scientific, medical, and public health disciplines to help solve this critical public health issue. AFM is a rare condition that affects a person’s nervous system, specifically, the spinal cord, causing weakness in one or more limbs. Beginning in 2014, the United States has seen an increased number of AFM cases, mostly in children. In 2018, there have been 106 confirmed cases of AFM in 29 states; all but five have been in children ages 18 or younger. IAC recently updated Standing Orders for Administering Inactivated Poliovirus Vaccine to Children and Teens. Changes were made to insert information about the option of subcutaneous administration of IPV, since the subcutaneous alternative had been inadvertently omitted in the 10/18 updated version. On October 23, the Global Polio Eradication Initiative published From polio victims to polio eradicators, on the frontlines of Pakistan’s battle against polio on its website. The first two paragraphs, along with highlights from three personal stories, are reprinted below. For some of these workers, the cause of polio is very personal. They have been paralyzed by polio themselves, and today, they are the greatest champions and advocates of polio vaccines within their communities. On World Polio Day, meet Rozi, Ashfaque and Bushra who are ensuring that no child succumbs to polio as they did. Rozi: Being a person with disability, studying in a regular government school was too much of a hindrance in terms of physical accessibility. Consequently, I dropped out of primary school because I felt the environment was not inclusive for people like me. Residing near the Pakistan-Afghanistan border, the Friendship Gate, I would always notice the workers administering polio drops at border. As inspiring as it was to see their commitment to vaccinate hundreds of children every day, I noticed a lot of parents rejecting the vaccination as well. Seeing this, I resolved to work as a polio worker myself to raise awareness about the disease and the vaccination itself. Ashfaque: I quickly jumped on the opportunity to work as a Social Mobilizer in the Polio Eradication Initiative. Since then I have sought to not only vaccinate children, but also sensitize parents and the community about the irreparable dangers of polio and the importance of vaccinating all children under the age of five. I hope to see Pakistan rid of polio within my lifetime. Bushra: Growing up, I was left out from sports, and being an avid sports fan, the experience was very isolating for me. The community members, my teachers, and fellow students often pitied my condition. These unfortunate circumstances made me all the more determined in fighting polio within my community. Read the complete article: From polio victims to polio eradicators, on the frontlines of Pakistan’s battle against polio. WHO published World malaria report 2018 and This year's World malaria report at a glance on November 19. A summary of the report is reprinted below. The World malaria report, published annually, provides a comprehensive update on global and regional malaria data and trends. The latest report, released on 19 November 2018, tracks investments in malaria programmes and research as well as progress across all intervention areas: prevention, diagnosis, treatment and surveillance. It also includes dedicated chapters on malaria elimination and on key threats in the fight against malaria. The report is based on information received from national malaria control programmes and other partners in endemic countries; most of the data presented is from 2017. This year's report shows that after an unprecedented period of success in global malaria control, progress has stalled. Data from 2015–2017 highlight that no significant progress in reducing global malaria cases was made in this period. There were an estimated 219 million cases and 435,000 related deaths in 2017. A survey underwritten by C.S. Mott Children’s Hospital asked a national sample of parents about getting flu vaccine for their children. The Mott Poll Report was published on November 19, 2018, and the "Highlights" section and selections from its "Implications" section are reprinted below. Provider recommendation is linked to high flu vaccine rates, but 1 in 5 parents said their child’s provider did not make a recommendation. Parents of children not getting flu vaccine this year reported 7 times more negative sources than positive sources about flu vaccine. Comments from family, friends, and other parents were the most common sources prompting parents to question or not want flu vaccine for their child. A noteworthy finding from this Mott Poll is that there may be somewhat of an echo chamber of information sources about flu vaccine for children. Parents who decided to get flu vaccine for their child reported hearing or seeing information about flu vaccine that is largely in favor of flu vaccine – in fact, these parents reported four times as many information sources that prompted them to want to get their child vaccinated. The opposite was true for parents who decided that their child will not get flu vaccine: they reported seven times as many information sources that made them question or not want to have their child vaccinated. In both cases, parents recalled information that supported their flu vaccine decision. Overall, findings suggest that child health providers play a critical role in helping many parents understand the importance of annual flu vaccine for children. However, for many parents, child health providers are not the sole influence, or even the primary influence, on decisions about flu vaccine. As such, other mechanisms are needed to convey accurate information, in language parents can understand, about the importance of annual flu vaccine for children. Read the complete Mott Poll Report: Do Parents Have Selective Hearing about Flu Vaccine for Children? The Mott Poll Report is a publication of C.S. Mott Children’s Hospital, University of Michigan Department of Pediatrics and Communicable Diseases, and University of Michigan Child Health Evaluation and Research (CHEAR) Unit. In late 2017, the Immunization Action Coalition (IAC) announced the publication of its new book, Vaccinating Adults: A Step-by-Step Guide (Guide). The entire Guide is available to download/print free of charge at www.immunize.org/guide. The downloaded version is suitable for double-sided printing. Options are available online to download the entire book or selected chapters. The development of the Guide was supported by the National Vaccine Program Office (NVPO) and the Centers for Disease Control and Prevention (CDC). Expert staff from both agencies also provided early technical review of the content. Do Children Have Vaccination Rights? In this Medscape "Commentary," Arthur L. Caplan, PhD, presents a moral stance that every child has the right to be vaccinated. Children cannot protect themselves from measles or the flu. He suggests that with vaccination, we should begin by focusing on the rights of children rather than of parents. Medscape login is required.